As a driver, nothing is more terrifying than not being fully aware of what is behind a school bus. 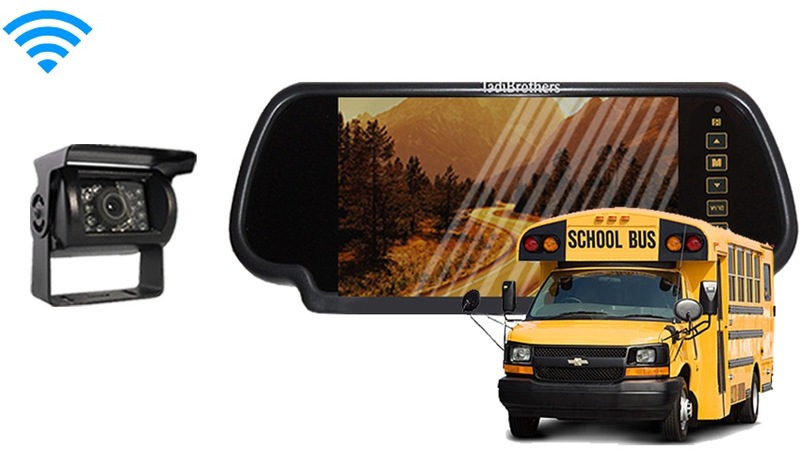 An absolute necessity for any school district or other organization with buses is the School Bus Backup Camera System (7" Mirror Monitor with Wireless CCD Mounted RV Backup Camera) from Tadi Brothers. The included 7” mirror that comes with this system clips directly to your regular rearview mirror. When the camera is turned on, clearly watch the world behind you and create a safer driving environment for you, your passengers, and others that may be standing or running around the bus. When the camera is turned off, your monitor turns back into a regular reflective mirror. Even when turned on, parts of the mirror are still able to be used as a mirror. As with our other monitors, this camera has two video inputs that can be used for DVDs, gaming consoles, or additional cameras. Waterproof, night vision, rocking clarity - what’s not to love about this camera? The RV box camera that comes along with the School Bus Backup Camera System (7" Mirror Monitor with Wireless CCD Mounted RV Backup Camera) is Tadi Brother’s toughest built camera. It is capable of withstanding harsh weather and direct hits by rocks. Enjoy the wireless feature of this camera system, and never have to worry about the wandering hands of youngsters interfering with the operation of the camera. Shop Tadi Brothers today to create a safe environment at your school or other organization. This wireless camera has a 70ft range that can go through any vehicle. Also, This system, like most of our vehicular products that have an LCD screen, can be used for video gaming, Considering thata perk or bonus for purchasing our back up system (others block that feature). "I tried to connect the wireless transmitters to the 12 V of my system but the wires to connect the 12 walls are too thin it took me a while to get it working. When I was finally done I am relatively satisfiedwith the product but I think they could’ve been me improve the quality of the wires it doesn’t have to be so thin I have to admit that the servers a parent was extremely helpful throughout the whole process but my review has to be honest reception was pretty good, the wires were too thin. After spending weeks shopping on eBay and buying different transmitters dad didn’t even go for 10 feet I guess Tadibrothers beat them all I just think that the price of the transmitter was a little expensive but what can I do it was still better than anything else I saw there let’s hope it holds up. You can be sure that I will be back and update this review if there’s a problem. I really do want to send a thanks to Eddie and Tommy who took care of me after service department I know that I can be a little difficult as a customer but they were very patient with me and ultimately my transmitter were working and I guess that’s all that matters. "